We're one year away from the release of The Hobbit: An Unexpected Journey, Peter Jackson's two new movies set in the land of Middle-earth. Serving as a prequel to The Lord of the Rings, The Hobbit tells the story of a young Bilbo Baggins (this time played by Martin Freeman) who, asked by Gandalf the Grey (a returning Ian McKellen), sets out with a band of dwarven fighters to the Lonely Mountains. (L-r) JAMES NESBITT as Bofur, MARTIN FREEMAN as Bilbo Baggins (front), STEPHEN HUNTER as Bombur, GRAHAM McTAVISH as Dwalin, WILLIAM KIRCHER as Bifur and JED BROPHY as Nori in New Line Cinema’s and MGM’s fantasy adventure “THE HOBBIT: AN UNEXPECTED JOURNEY,” a Warner Bros. Pictures release. Photo by James Fisher. 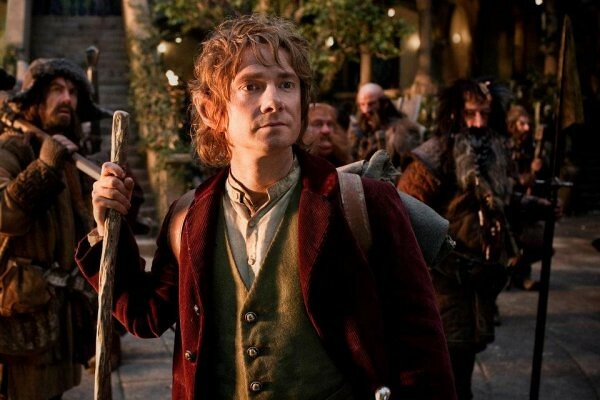 The first trailer for The Hobbit: An Unexpected Journey arrives online late tonight. The movie itself gets released in theaters on December 14, 2012. The second movie, The Hobbit: There and Back Again, is set for release on December 13, 2013.
sets out with a band of dwarven fighters to the Lonely Mountains. I think it's just "the Lonely Mountain."